There are some summer movies that are ridiculous for the sake of it. That is what makes them true to the nature of the season in which they are released in. The summer movie season has been notorious for dumping big movies with crazy plots which throw logic every which way but the straighten arrow. Sometimes, especially during the summer movie season, it is okay to turn your thoughts off and sit back to enjoy the show. Let's be honest here, movies aren't meant to be shrouded in realism, no matter what some movies do. They are meant as an escape and for entertainment and during the summer months, sometimes its forgivable to go a little overboard. Adam Sandler is an actor I admire, but he hasn't been himself for several years now. He's like an Eddie Murphy who still works, he just seems to pride himself on making terrible choices. His output these passed few years have been head scratchers, to put it in nice terms, and its terrible that his movies still make money, because it seems Sandler has overshadowed his obnoxious humor over everything that worked in his earlier career, and that's a shame. Sandler was once a prominent actor who we could always count on, now he's simply a self-parody of all of his worst qualities. At the same time, his movies have this cutsey-poo, sentimental values that don't mesh well with all of his fart and poop jokes and his crazed demeanor. There is nothing else like an Adam Sandler movie, but I am not sure that is a good thing. There are signs of life in Adam Sandler career, and that shows in "Hotel Transylvania." I was hoping for the same thing with "Pixels." I get it, its a really weird movie. If you haven't seen it already, its essentially a movie about aliens watching our old video games and designing an invasion on Earth by creating weapons based upon those old games. In response to this invasion, the President of the United States gets the best gamers in the world to use their expertise in defeating the threat. Its a silly, silly movie and most critics have been harsh on it simply because of how silly it is. Yes, this is a movie that throws logic out the window. The video game experts in this movie (played by Sandler, Josh Grad and Peter Dinkage) use light energy canons, and they literally "play out" the game scenarios because of the aliens. Playing a video game is one thing, actually being the game is another. I love Lui Kang from "Mortal Kombat," but actually fighting Shang Tsung myself? That wouldn't pan out too well for me. But in the season of dumb summer fun, I felt I was able to forgive how hokey that part of the movie was...for the most part at least. "Pixels" real problems stem from the most basic of circumstances. For an Adam Sandler movie, its really not that funny. Hey, I don't think "Blended" or "Grown Ups 2" are great by any means, but at least they can get me to crack some sort of a smile. When I sit through a Adam Sandler movie stone-faced, that to me is a big problem. 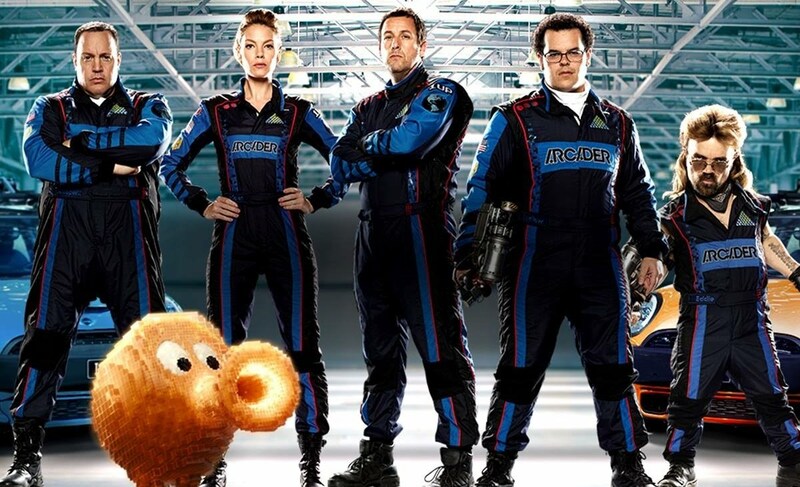 As far as its humor goes, "Pixels" is a typical, modern Sandler movie. A bunch of unfunny obnoxious humor with a hidden Disney life-lesson buried under all of it. I don't really understand how Sandler feels he can balance between being nuts and being emotional, but it still doesn't work. While I will say that the toilet humor is pretty non-existent in this movie, I did expect to laugh some, which didn't happen in "Pixels." Sandler and Grad do what they can. I think Peter Dinkage does a good job, but the script lets him down. Michelle Monaghan shows up as an aide to the President, who is played by Kevin James. Both James and Monaghan are good, and they deliver as much as they can. I loved the cameos by Sean Bean and Brian Cox. I think this cast understood how hokey this premise was, but they made the most of it anyway, and I can at least appreciate their efforts. I just wished that this movie could matter on some level. "Pixels" could have been a fun movie, and there was a lot of dumb stuff in the movie that I could give a pass too. I didn't mind that the aliens were giving the humans "a set of lives" just like in a real video game before they completely conquered the Earth, even though it made zero sense of a conquering standpoint. I didn't mind the aliens using video game characters to defeat us, even though their powers could have had us destroyed right from the very beginning. The sad part is that it doesn't seem like Adam Sandler is trying hard anymore, which makes something like "Pixels" frustrating to sit through.